The 2017 NBA Draft represents of the most important days in the recent history of the Los Angeles Lakers. Here are some blockbuster draft-day trades they should consider pursuing. Given their recent lack of success, the 2017 NBA Draft looms as possibly a franchise-altering day for the Los Angeles Lakers. Despite a slew of recent high lottery selections, the Lakers have fallen off the map in terms of their on-court respectability. Since their last playoff appearance in 2013, the Lakers have compiled a disastrous 91-237 record. They are now onto their third head coach over this span following the hiring of Luke Walton last offseason. Since then, the Lakers front office has also undertaken a significant facelift. 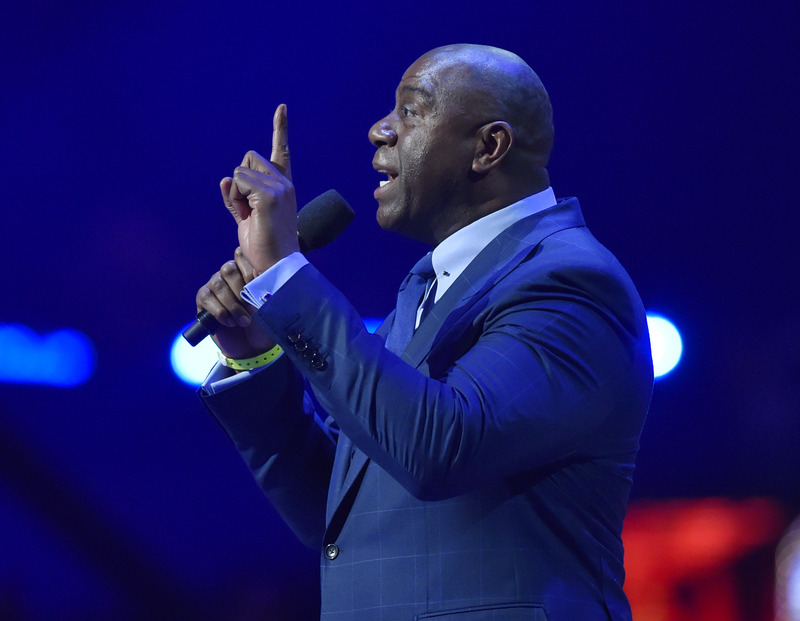 First, Lakers’ legend and Hall-of-Famer, Magic Johnson, was named the team’s president of basketball operations, replacing long-time incumbent Mitch Kupchak. Furthermore, long-time player agent, Rob Pelinka, was named as the Lakers’ new general manager. These hiring’s coincided with team owner Jeanie Buss assuming complete control of the franchise, thus representing a fresh start for all involved. Which brings us to the draft. Such a glowing report, however, presents just one of a number of quandaries for the Lakers entering the draft period. Despite Ball being a homegrown Laker, and his clearly undeniable talent, there is very rarely a certifiable “sure thing.” Furthermore, there’s the overbearing and often controversial presence of his Ball’s father, LaVar, to consider. A virtual walking, talking sideshow, Ball SNR’s exploits, such as this recent example, could easily sway the thinking of Johnson, Pelinka and co. when it comes to such a pivotal decision for the franchise. Johnson is all about winning. With a No. 2 overall pick in hand, combined with a number of exciting, up-and-coming players currently on the Lakers’ roster, the time could be right to work their way back to relevance by pulling off a draft-day, blockbuster move. It’s not often that a player averages 27.0 points, 5.9 assists and 4.9 rebounds over the course of a season and misses out on All-Star selection. But such was the case with Lillard, who was again overlooked by the coaches in an absolutely loaded Western Conference backcourt. The Blazers’ starting point since entering the league in 2012, Lillard once again led Portland into the postseason for the fourth consecutive season. But after leading the Blazers to back-to-back 50-plus win season’s, the Blazers have dropped back to 44 and 41 wins over the last two seasons. The main knock on Lillard, and the Blazers for that matter, has been their inability to perform at the defensive end of the court. So while Lillard will never be confused for Gary Payton, he is simply elite at the offensive end. This season, the Blazers had an offensive rating (points per 100 possessions) of 110.1 when he was on the floor, and just 102.9 when he was resting. Over his 75 games this season, Lillard had five games of 40 or more points, which included two games of nine three-pointers made. To illustrate Lillard’s importance to the Blazers, Portland had a 9-2 record over the season when Lillard scored 36 points or more. His preeminent game this season was a 59 point explosion against the Utah Jazz, the team with the third-best defensive rating (points allowed per 100 possessions) this season at 102.7. Scoring 59 of the Blazers’ 101 points, Lilllard shot 18-of-34 from the field, 9-of-14 from behind three and 14-of-16 from the free-throw line. You could name on one hand the amount of players in the league capable of putting together a performance such as this, which included 26 points in the first quarter alone. Therefore, putting together a package to suffice the Blazers is going to take some work. Having somewhat regressed the last two seasons, the Blazers will be under no illusions that they will need to make some moves this offseason. Whether that is adding some pieces to their current roster, or breaking it down and starting from scratch remains to be seen. While this deal involves giving up their best player, the Blazers would still remain a more than competitive team, both in the present and the future. On the Lakers’ behalf, this delivers them a legitimate star who is still just 26 and has the prime of his career ahead of him. Maurice Harkless, meanwhile, is coming off a career-best season averaging 10.0 points, 4.9 rebounds and 1.1 steals per game. At 6’9″, and with the ability to alternate between the 3- and 4-spots, the 24-year-old Harkless’ athleticism would be a tremendous fit under Walton’s system. While all the blame can’t be placed on Lillard, the Blazers as a whole remain substandard defensively. This season they ranked 21st with a defensive rating of 107.8, and 25th for opponent points per game at 108.5 per game. Over the season, the Blazers compiled an 0-10 record in games where they gave up at least 125 points to the opposition. This deal would also allow the Blazers to place the ball more in the hands of guard C.J. McCollum. Last season, McCollum had 10 games where he registered six or more assists. Playing alongside Jordan Clarkson, himself a capable ball handler, can create a new and interesting wrinkle for the Blazers. In addition to adding another frontcourt bruiser like Julius Randle, the move would allow the team to think laterally, and not necessarily lock down Lonzo Ball will the selection. As such, the No. 2 pick would be utilized on a player such as Duke’s Jason Tatum or Kansas’ Josh Jackson. In order to clear room in their rotation, the Blazers could do worse than attempt a salary dump with the Brooklyn Nets with a player such as Allen Crabbe, whom the Nets signed to an offer sheet last offseason. This would be done by attaching one of the Blazers’ three other current first round selections in order to sweeten the deal. Furthermore, this provides them with the rare chance to own a high-end lottery pick. 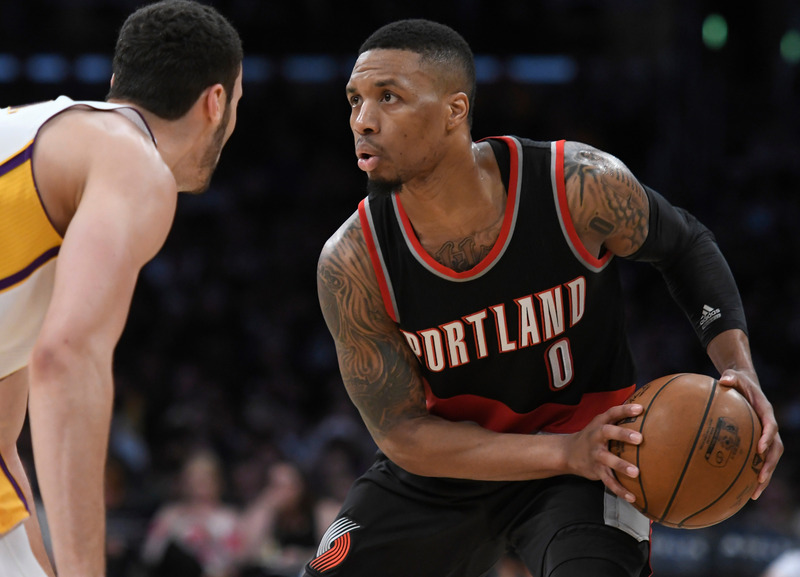 Since general manger Neil Olshey assumed the reins in 2012, just three draft picks under his watch remain on the roster – Lillard (No. 6 in 2012), Meyers Leonard (No. 11 in 2012) and McCollum (No. 10 in 2013). The highest pick over the last three seasons was Rondae Hollis-Jefferson (No. 23 in 2015) who was subsequently dealt away on draft night. This year, the Blazers currently hold picks No. 15, No. 20 and No. 26. But adding the No.2 pick would represent the highest they’ve selected since landing Greg Oden No. 1 overall in 2007. One of the main points of contention in the deal lies with the Blazers landing center Timofey Mozgov. After signing a four-year, $64 million deal last summer, Mozgov averaged just 20.4 minutes per game this season. Essentially, this illustrates the decreasing importance in the league of the traditional inside pivot, hence making Mozgov’s contract somewhat of a liability. Having said that, this is simply the result of making the deal work financially and the cost benefit of reaching such exciting young talent from the Lakers. But back to the Lakers. Not only are his best years ahead of him, but Lillard’s durability has been a highly underrated aspect of his career. Over his five seasons in the league, Lillard has missed a total of 14 games. A career 37 percent shooter from three and 87.7 percent from the free throw line, Lillard would represent a great first step in Johnson’s plan to rebuild the Lakers. With Lillard in tow, a core of Brandon Ingram, D’Angelo Russell, Larry Nance Jr., Lillard and Harkless would certainly make the Lakers a more than exciting team to watch. If he isn’t one already, then Booker is basically knocking on the door of stardom. 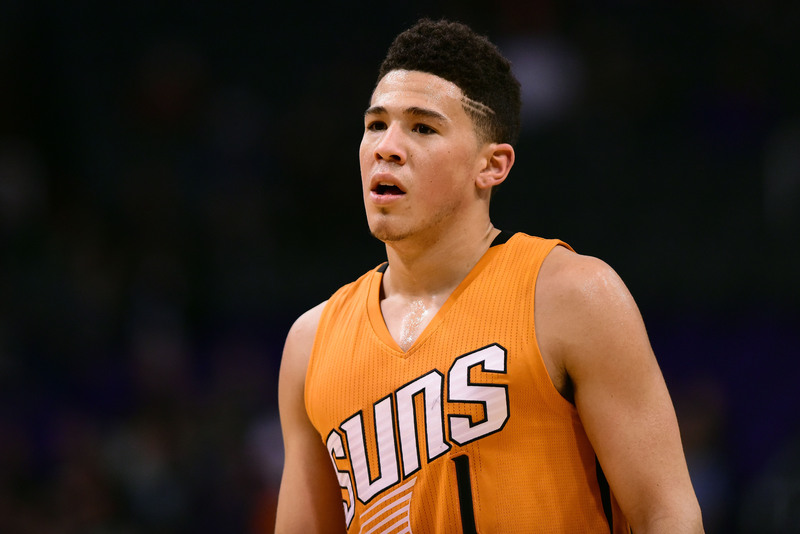 Still just 20, Booker just completed his second season with the Suns, and improved markedly as the season progressed. Overall, he averaged 22.1 points and 3.4 assists in 35.0 minutes per game. But from Jan. 3, Booker took off. Over his final 44 games, Booker averaged 24.8 points, 3.6 assists and 3.5 rebounds. Notably, he shot 39.4 percent from three-point range and 83.9 percent from the free throw line. Again, he is just 20. But the exclamation point in his sophomore season came during a late season road game against the Boston Celtics. Playing 45 minutes, Booker scored an astonishing 70 points, converting on 21-of-40 attempts from the field and 24-of-26 attempts from the foul line. This was just the 11th time in league history that the 70-point barrier had been reached. In order to satisfy the Suns, the Lakers will require a third party to join in the transaction. In this instance, the Chicago Bulls have an incredible asset in the form of Jimmy Butler. A two-time All-Star, Butler averaged 23.9 points, 6.2 rebounds and 5.5 assists per game this season, cementing his place as one of the preeminent two-way players in the game. With this in mind, this deal presents a great opportunity for the Bulls to garner some significant assets in return. Not only do the Bulls receive the No. 2 overall pick, they also acquire Brandon Ingram, the No. 2 overall pick in 2016, and a future first round selection from the Suns. The added cost of jumpstarting the rebuild for the Bulls is taking on the remaining three years of Timofey Mozgov’s $64 million contract. For their part, not only are the Suns receiving Butler, they also hold the No. 4 overall pick in this year’s draft. In addition to other emerging prospects such as Marquese Chriss and Dragan Bender, incorporating a talent such as Butler with his prime years ahead of him simply represents an exciting era for the Suns. In addition to Booker, the Lakers would receive the No. 16 overall pick from the Bulls, therefore allowing the Lakers to still have some chance of selecting a potential piece of their ongoing rebuild in this year’s draft. Also, they would receive veteran Tyson Chandler for financial purposes, with the added bonus of Chandler’s current deal expiring one year earlier than Mozgov’s. Despite being limited to 47 games, Chandler still managed to average 8.4 points and 11.5 rebounds, thus demonstrating he would still have something to offer this up-and-coming Lakers squad. If there’s a team that’s in need of an overhaul, it’s the New York Knicks. 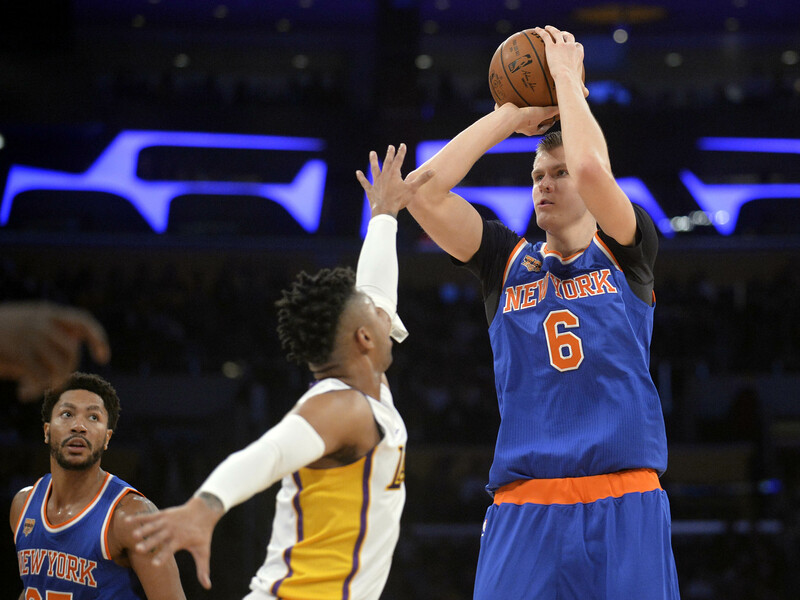 While Porzingis is undoubtedly one of the league’s rising star’s, making a deal with the Lakers could enable the Knicks to completely start from scratch and build from the ground up. Furthermore, there is the current frosty relationship between Porzingis and the Knicks’ front office. Or more specifically, team president Phil Jackson. Following the end of the Knicks’ season, Porzingis decided to skip the team’s annual exit interviews, primarily due to the dysfunction and drama surrounding the team. The three leading scorers for the Knicks this season were Carmelo Anthony, Porzingis and Derrick Rose. As a free agent, Rose is unlikely to be retained by the Knicks, whereas Jackson has made it abundantly clear that he sees Anthony’s future elsewhere, despite Anthony holding a no-trade clause in his contract. This season, Porzingis averaged 18.1 points, 7.2 rebounds and 2.0 blocks in 32.8 minutes per game. One of his best games of the season was a 35-point, seven-rebound performance against the Detroit Pistons. Having said that, what executives say in public and private can be a completely different thing. That’s not to say that Johnson is being misleading. But if he were in a position of receiving such an offer, his public sentiments may be swayed somewhat behind closed doors. The Knicks also pick up a young, exciting player in Clarkson on a very respectable contract. Furthermore, they also receive a future first round pick in order to sweeten what appears to be a win-win from both sides of the equation. Meanwhile, veteran Courtney Lee will be able to share the backcourt with Russell, providing a steadying hand on both ends of the court. But ultimately, the Lakers landing the 7’3″ Latvian would simply be a feather-in-the-cap for Johnson. With the ability to shoot from absolutely anywhere on the floor, the 21-year-old Porzingis represents the prototypical stretch-big for many years to come. 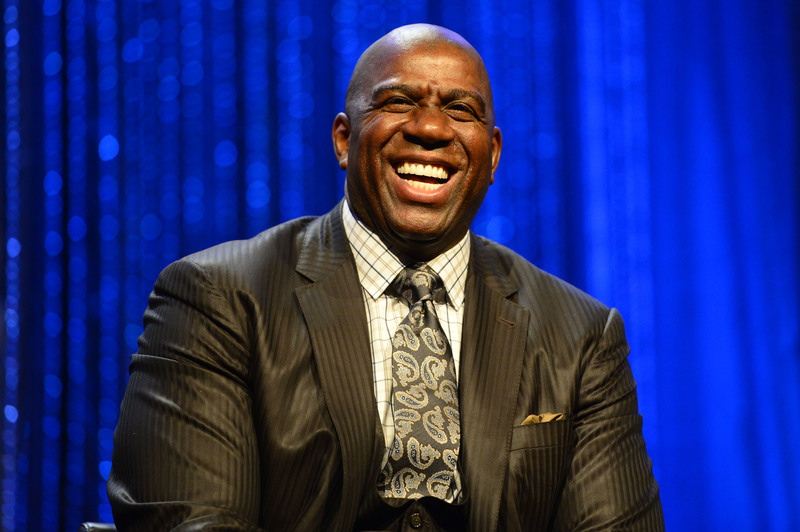 As we are all aware, Magic Johnson is all about winning. Five NBA titles as a player, and an ensuing business empire following his playing career, means Johnson knows what it takes to make a franchise successful. One of his first steps in charge will be to restore the image of the Lakers by landing a marquee name. Not only will landing a marquee name help generate interest in the team for the interim, it can also help significantly in the ensuing years in attracting free agents. In recent times, players of the ilk of Kevin Durant wouldn’t even convene free agent meetings with the team, such was the lowly impression of the franchise from afar. The rumors of Paul George joining the Lakers, most likely when he becomes a free agent in 2018, never seem to die. But in order to make things more appealing to George, the acquisition of a star of the caliber of those discussed here would not hurt in the slightest. Then there are the latest comments, most notably from ESPN‘s Jalen Rose, indicating that LeBron James could possibly leave the Cleveland Cavaliers once again when he becomes a free agent in 2018. While he didn’t actually name the Lakers, Rose did state on his main media forum, Jalen & Jacoby, that James’ possible destination’s “would not include the Kings or the Clippers.” The Ringer‘s Kevin O’Connor has also reported that L.A. could be a landing spot for the King in the near future. But whether it’s James, George out any other superstar player who comes out of contract, the Lakers have ceased to become the destination that players set their sights on. In adding one of the three players discussed, Johnson and co. would be shoring up the Lakers’ fortunes for both the short- and long-term outlook, and in the process, potentially returning the Lakers back to their glory days.